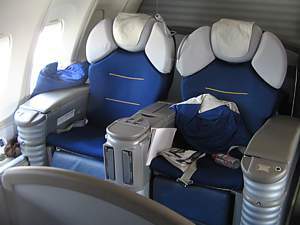 Seat Pitch Economy 31" Business Flat 78" First 82"
NEWS: Lufthansa now has a fleet of Airbus A380 superjumbos operating - and with it, the newly developed First Class cabin. It flies to destinations including Johannesburg, Tokyo, Beijing, Singapore, Miami, San Francisco, and New York JFK. Shorthaul Lufthansa is fitting a new slimline seat developed by Recaro, which gives a higher seat density, and Lufthansa Reviews are not always positive as a result. Lufthansa are the efficient, business like, top quality, and totally soulless national airline of Germany. It gets its passengers where they want to go with ruthless efficiency, and generally pretty much on time. There is a vast route network covering most of Europe, although requiring a change at either of the two main hubs, Frankfurt or Munich. Add to this good solid food, a brilliant First Class terminal, and great drinks, and its surprising more people don't fly on "Luffy". In the premium classes, it's important to note that Lufthansa have put their money behind ground services. The First Class or Hon lounges are top notch (and some of the best on any network), however the seats and flight are not that great (there is little privacy, and the meals are so-so). Move back a cabin, and a Lufthansa business class review generally moans about the way the flat-bed seats actually have you lying on a slope, and are some of the worst modern seats in the air. You are given to the feeling that you've only paid a little bit more for, well, a bit better food and a couple of extra inches legroom, while the lounges are just a good place for a free beer on a plastic seat, as opposed to sitting outside on a plastic seat. 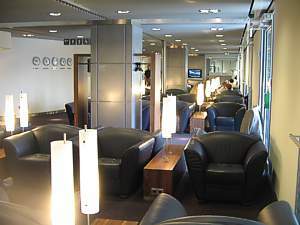 Read more about Lufthansa's Business Class lounges. For most passengers though, it is Lufthansa economy that they'll pay their money and get to ride on. And here, Lufthansa are still not that innovative, and just offer a basic seat with a pitch of 31 inches, although you do at least get a full seatback TV with AVOD on the A380. 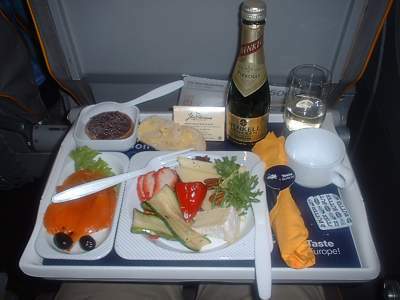 At least in terms of service, Lufthansa maintain good traditional values, which means at least one hot free meal on international flights, and a free bar even on the shortest flights: compared to some US carriers it can seem amazing to have Lufthansa cabin crew asking if you'd like another (complementary) beer, or a Baileys after your meal. Equally, headphones on the flight and checked bags come without any extra charge. Read more about Lufthansa's seats and cabins. Fares have been dramatically slashed in recent years. Alas Lufthansa Reviews are generally negative in economy, because of the appalling inflight entertainment (Lufthansa are only now retrofitting seatback TV screens), a very tough frequent flyer scheme, and brusing customer service. As a passenger, you are expected to be at the terminal on time, not ask for anything in the way of favours, and sit down promptly. Above all, don't moan. In short if you know what you're in for, its great. If not, it can be a bit of a shock. Read more about Lufthansa's inflight experience. Lufthansa's Frequent Flyer Scheme, Miles & More, is also not the best in the world unless you know exactly what you are getting. Forget about trying to get any status if you just fly in economy - it isn't going to happen, as Miles&More is notorious as being unbelieveably hard to earn gold level, which is virtually given away for free by other airlines if you just take one longhaul flight. Equally, there are much better schemes if you just want to gain free flights by earning the miles. Lufthansa's Miles & More details. 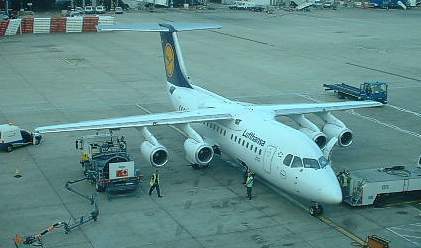 Lufthansa has a small subsidiary, Eurowings, which brings together five small airlines - Lufthansa CityLine, Air Dolomiti, Augsburg, Contact Air, and Eurowings itself. It flies to smaller destinations that Lufthansa may not supply, and also in parallel with some routes Lufthansa itself serves at busier times of day. In short, Lufthansa product reviews, show a very business-like airline, which has few flourishes, but which will get you there in a very professional way. While it's hard to like Lufthansa, the way they will get you there and give you exactly what you pay for is hard to beat. Note that all reviews and opinions on Lufthansa (LH) food, service, seats, planes, upgrades, lounges, and the Miles & More Frequent Flyer scheme is soley at my judgement. No legal liability is accepted if you take my advice.